Dream Into Dust certainly don't rush things. So Beautiful And So Dangerous, their third album comes almost a full decade after The Lathe Of Heaven. For those unacquainted, Dream Into Dust is the solo-project of Derek Rush. Way back Derek Rush featured in Loretta's Doll who released some albums on World Serpent. He also features in the "damnbient" project A Murder Of Angels, alongside Bryin Dall of Thee Majesty and Hirsute Pursuit. His compatriot from those days Bryin Dall also features here. 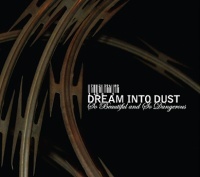 In base terms Dream Into Dust in many ways fall into the industrial-goth-rock type genre, but that only tells part of the story. On the opening track 'Counterfeit', Dream Into Dust come close to the industrial rock of Nine Inch Nails, as the track lunges from textured effects into gritty electronic throbs underpinned with skittering hyper hi-hat rhythms and Derek Rush's angsty vocals. Yet there are no rock guitars here, in fact the only guitar that features here is a brief snippet of toy guitar that appears between the passages of electronic throbs and industrial rhythms. 'Counterfeit' seems to mark an early breakpoint in So Beautiful And So Dangerous, leading listeners into a false sense of what will follow. The rest of the album veers between Rush's expressive songwriting marrying melodic tones with more subtle experimental tinges. Most of those experimental touches come from Bryin Dall whose contribution here shouldn't be underestimated as his noise and electronic treatments act as more than mere embellishment to Rush's songs; they are integral to the song structure. Derek Rush's vocal style is both emotive and melodic, and at times even poppy. It's quite a unique vocal for this type of music and at points it adds another detail to the sonic palette of Dream Into Dust. So Beautiful And So Dangerous is delivered with a high quality production with subtle nuances in sound. 'End of Memory' the second track carries a slight bluesy feel to the brittle acoustic playing, riddled with waspish electronic treatments. As it builds Rush's melodic tones carry strains of Muse and Radiohead but the arrangements from Bryin Dall push this into more sophisticated noisey realms. 'Secondhand Daylight' - with its obvious nod to Magazine - is much more atmospheric, unfurling in a slow, restrained piece that builds slightly and lightly with Rush's vocals framed by warped chiming shoegaze guitar. Like most of So Beautiful And So Dangerous there are passages of electronic experimentation. In fact the album is interspersed with short tracks of ambient experimentation with track titles given the names of wildflowers ('Nightshade', 'Foxglove', 'Stinging Nettles'), the deadly ('Venus Flytrap') and the mythical ('Black Lotus') exemplifying the album's title, So Beautiful And So Dangerous. The pinnacle of Rush's songwriting blending pop with experimental touches is reached on 'Bruises Never Fade'. Arising from ripples of noise, ticking electro beat and crunchy synths, Rush wraps a melodic emotive pleading tone over the gritty backdrop. With the final passages accompanied by chiming synth work, it's a great slice of dark electro pop. Prior Dream Into Dust releases didn't bother with anything that could be considered club friendly. But with its pounding electro beats 'Suspended in Fear' seems destined for the dancefloor. So too does 'Perfect Vision' which seems to take its cues from New Order with its eighties analogue synth sound and drum machine rhythms. The later tracks appear to be built different sonically with less space to the song structure. 'Deaden the Pain' moves into a far, darker territory lead by slow, lumbering fuzz bass tones, overlayen with gloomy synths shrouded in layers of noise as a backdrop to Rush's vocal. Bookended by experimental atmospherics, the title track is densely built with crushing percussion, electronic effects, haunting synth work and downbeat piano chords, which dispels with any notion of melody. The closer 'Flowers of Destruction' merges melancholic acoustic guitar with atmospheric dissonance, where light guitar notes tumble to scrapes and creaks, deep buzzing tones, with Rush's fragile voice pushed to breaking point; just listen to the lone voice pitted against atmo-synth accompaniment. It all swells again, with brittle guitar pluck against buzzing noise tones and a synthetic string score bringing So Beautiful And So Dangerous to a satisfactory conclusion.